Often the term “retirement plan” is mistakenly used to describe the steps an individual or family takes to reach retirement. For example, one may ask how much money you have in your retirement plan, or when your retirement plan will allow you to retire. A true retirement plan goes into action the day you actually do retire. Many Americans view their retirement date as a moving target. Unfortunately, employment for many “older” Americans can be like a NASCAR driver completing lap after lap with no finish line in the distance. This is not because the worker does not want to retire; it is because they don’t know what the checkered flag looks like when it comes to the ability to retire. I have had countless pre-retirees in my office anxious to begin retirement. Many of these pre-retirees have been surprised during our visit when I tell them they crossed the finish line 3 laps ago. The truth is, that for some would-be retirees, it is costing them more money to work than it would to retiree. Imagine having someone tell you that seven of the eight hours you work tomorrow will be for free. On the flip side, stock market volatility and lower wages have forced many would-be retirees to work into, or beyond, their 70s. There are many financial advisors willing to share financial strategy after financial strategy for those “retirement dollars” to grow, yet few advisors who truly share retirement advice. If you, your spouse or significant other are considering retirement in the next 5 years, please consider these six key elements to a happy, stress-free retirement. 1. Income Giving up a paycheck is perhaps one of life’s most difficult financial decisions. It is a mental and psychological leap to jump from the acquiring stage of life to the distribution stage of life. Retirement income normally comes from one, or all, of three places. The first place is Social Security, where there are hundreds of variations in beginning Social Security Income. These variations include early, spousal, filing and deferring, full retirement age, and age 70 benefits, just to name a few. With today’s modern technology, it is relatively simple to find the best way to maximize your Social Security Income. 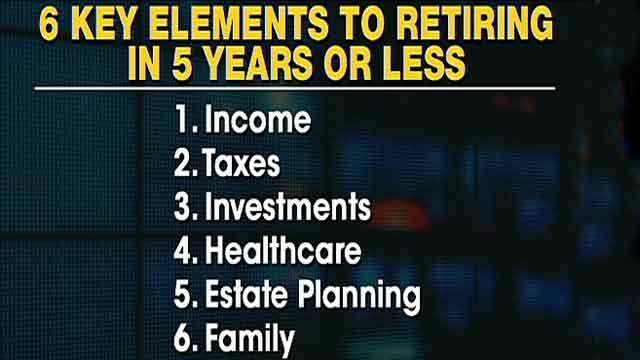 Second on that list are pensions. Pensions are unfortunately heading the way of the dinosaur. These days, state and federal employees continue to have pensions offered to them most often. Always remember your spouse when selecting pension options. Most pensions will offer continued spousal benefits, ranging from 25% to 100% of the deceased employee’s income. Of course, this means a sacrifice in income now, while the retired employee is alive. The rule is simple: the greater the benefit for the spouse, the greater the reduction in your current monthly income. Too many widows and widowers have shed tears on my conference room table because they did not choose pension options wisely. The third and final place on this list is investment income. Investment income comes in all shapes and sizes and usually includes IRA/401K distributions, rental property income, dividends, annuities, bank interest, and long/short term capital gains. The key to investment income is to remember it’s not what you earn, it is what you keep that counts. 2. Taxes They say the only certainties in life are death and taxes, and I would like to add that both have a rather negative effect on retirement. I believe that seniors and retirees are the most abused group of tax payers in our country. Unfortunately, when it comes to taxes, “No good retiree goes unpunished.” The retirees who have paid off their homes, contributed to retirement accounts and have solid forms of retirement income are at the greatest risk. Married couples begin to have their Social Security Income taxed at a low $32,000 of modified adjust gross income. I guess at that income level, Congress and the President must categorize you as a “wealthy retiree” who must “pay his or her fair share.” Understanding how your retirement income and investments are taxed and how they affect your Social Security Income is crucial to a sound retirement. I am all for everyone paying their fair share in taxes, but haven’t our retirees done that already? 3. Investments “Risk Tolerance” is perhaps the greatest oxymoron in retirement. Who wants to tolerate risk, especially during retirement? Way too many retirees come into my office with an asset allocation reminiscent of a 40-year-old at the height of their earning potential. Your traditional financial advisor gets paid for managing risk. If a retiree states they would like a zero-risk retirement strategy for their investments, should they still be paying between 1-2% per year in management fees? Please remember that the negative effects of stock market losses are magnified when you no longer have wages to contribute to the account that has suffered the loss. Consider conservative retirement products like bonds, CDs, treasuries, fixed annuities and fixed indexed annuities in your retirement strategy. Fixed indexed annuities are a great way to guarantee zero market volatility while still participating in some index linked returns. Be careful to evaluate the fees, caps, surrender charges and costs of all financial products you consider, though. The last thing to remember about investments is that there is no amount of money in the world you can pay to make an advisor care more about your money than you do. 4. Healthcare Our country’s healthcare system may be the only thing more volatile than the stock market. Many Medicare recipients are rightfully concerned about how cuts to physician and hospital reimbursements that fund ObamaCare will ultimately impact their healthcare. Ask yourself this question: knowing what you do today about the government meddling in healthcare, would you recommend any of your children or grandchildren go into medicine? The landscape of this once noble and financially lucrative profession has found itself attacked by the ire of the government and those who would have physicians’ wages parallel that of government workers’, whose training and education don’t come close to that of a doctor. Americans who are interested in retiring before the age of 65 are often faced with the dilemma of having to find private health insurance. Before retiring, speak with a healthcare professional to understand Medicare, Medigap and Medicaid advantage programs. These Medicare programs vary dramatically from state to state, so make sure you consult with a professional who understands the laws and restrictions in the state you will spend your retirement. 5. Estate Planning It is almost impossible to open the Yellow Pages (for those under thirty, the Yellow Pages are a big yellow book with business phone numbers and addresses we used before the Internet was invented by Al Gore) without landing squarely in the Lawyer’s/Attorney’s/Law Office section that seems to take up a third of the entire book. With that said, it is important to have a good legal estate plan as part of a stress-free retirement. There are plenty of websites out there advertising the “DIY” (do it yourself) estate planning documents, including wills, trusts, powers of attorney etc. I recommend an attorney licensed in your state. I am not saying that the less expensive website versions of estate planning will not work, but remember, the main focus of living trusts and wills is to have instructions once you’re dead. Once you are dead and gone from this world, wouldn’t you prefer to have the same attorney you worked with while you were alive stand up for and back up the document they prepared? One of the most common estate planning errors I encounter is from folks who have purchased and had a living trust prepared, yet have never taken the time to fund and title their assets into their living trust. 6. Family My dad would often say to make decisions for the hard questions before they are asked. This was sage counsel growing up. I already knew how I would respond to drugs, tobacco and other difficult decisions we face in our youth before the awkward moment even arrived. My counsel is the same for pre-retirees. Decide now how you will handle requests for loans and financial gifts from your children and others. How will you respond if one of your children or grandchildren needs a place to live? I have seen my once solid retirement portfolios lost, not by the volatility of the stock market but by indulgence of selfish requests from my clients’ children and grandchildren. I often tell my clients I am never opposed to giving a child or grandchild a leg up in life, but I am completely opposed to giving them a piggyback ride. The piggyback rides ultimately break the piggybank and rob children and grandchildren of the opportunity to learn some of life’s hardest and best lessons. Thomas Edison said, “Opportunity is missed by most people because it is dressed in overalls and looks like work.” If you choose to use your financial resources to benefit your heirs, use them to create memories that will last much longer than new cars or laptops.